It is the edge of Périgord Vert and Périgord Blanc, in the heart of the valley. Here, the Dronne gushes through. Both natural and tourist sites are nearby. You can step back in time to the Gallic and Gallo-Roman periods 10 km away in Ribérac with the trail of Roman (or Romanesque) churches and traditional Ribérac cupolas circuit and 30 km in Périgueux, which is classed as a town rich in art and history. 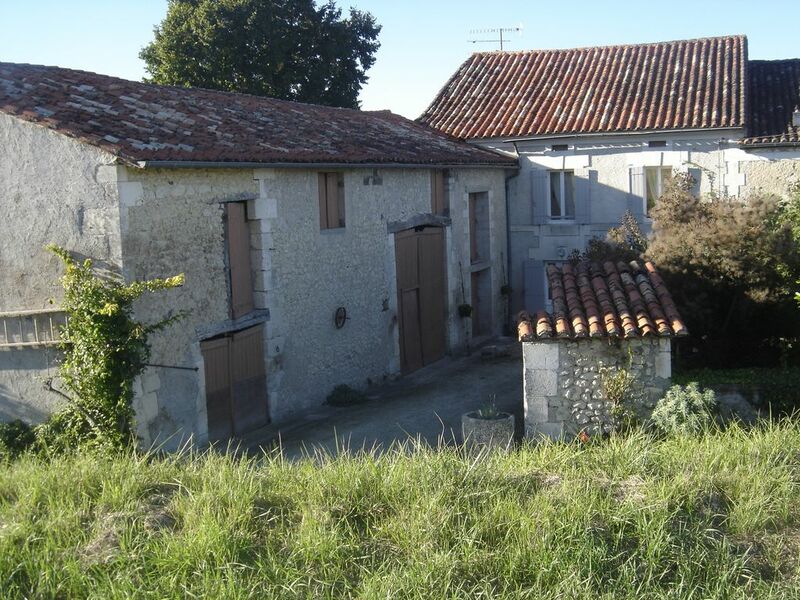 This former farmhouse is in the outskirts of the Saint Victor market town (400 m away). It has a 130-sq.m surface area. It was renovated in 2013 and was awarded a 3-star rating that same year. The ground floor offers an entryway, a living/dining room (flat screen television and a BluRay player), a fitted kitchen (dishwasher, fan-assisted oven, induction stove, fridge-freezer, toaster, coffee maker, electric kettle, and juicer), a shower room (shower and hair dryer) and separate WC, and a laundry room (washing machine, iron, and ironing board). Upstairs, you can find three bedrooms with two 140-cm beds and two 105-cm beds made upon arrival. Outdoors, you pass through an entry door to the courtyard, facing south, with a small garden on your right with aromatic herbs for you to use. The poolside offers a refreshing atmosphere at the end of the walled garden flanked by fig trees. It has garden furniture, a deck chair, a barbecue, and a grill. Walking and mountain biking trails begin on the doorstep. The road ends in front of the gite and you can keep going along the hiking paths to experience the different tree varieties (fig, linden, walnut trees, etc.) and the types of wild orchards. In addition, you can also meet our four goats who simply love it when you feed them dry bread! We are grateful to have this rental, a family home, because we hope that our region, Périgord Vert, will be holidaymaker's next discovery. We have completely renovated it in 2013 and it was awarded 3 stars by the department's tourist committee. In 2015, the new attraction is the 8 x 4-m pool with a depth of 1.20 m.
Set back from the large tourist hordes in Périgord, staying in our house brings peace and serenity while surrounded by greenery. This is a place to recharge your batteries. In front of the guest house, there is an open courtyard There is an extra, relaxing back garden. Thanks for a wonderful week in beautiful french countryside. Lovely restored gite with a typical rustic French feel. Very clean with spacious bedrooms. Sophie and Lionel were very friendly and helpful and also relaxed about arranging late access when we got delayed on the way. Lovely surrounding area with lots of nice places and things to do within easy reach. You won't be dissapointed if you are after a break where you can get away from it all in France. The pool is perfectly adequate for family fun. The single toilet and shower takes a bit of organising with 6 but it didn't detract from the stay. Thank you very much, we are delighted that you enjoyed your stay. For breakfast, indeed as it is mentioned in the description we do not provide food, but I am sure you have found good local products! See you soon. Repos rurale dans la tranquillité qui fait du bien! La tranquillité, l'ambiance et les facilités nous ont donnés deux semaines de repos agréable. Propriétaires gentils et modestes. The single toilet and shower takes a bit of organising with 6 but id didn't detract from the stay. Thank you very much, we were delighted to welcome you and we are very happy that our house have you more. We will consider your canopy idea in a future project, perhaps. La location est totalement conforme aux descriptions du site. Le calme est vraiment remarquable. Les propriétaires sont très réactifs si nécessaire. Nous pensons revenir une semaine prochainement. C'est avec un grand plaisir que nous vous accueillerons à nouveau ! Nous avons passé un très bon séjour à Saint-Victor, en dépit du mauvais temps. Votre gîte est un agréable cocon dans lequel nous avons apprécié les fêtes de fin d'année. Confortable, simplement mais joliment décoré, un havre de paix alors que le vent et la pluie faisaient rage à l'extérieur... Nous vous remercions sincèrement pour votre accueil chaleureux et votre disponibilité. PS: Quelques portemanteaux supplémentaires seraient utiles au rez-de-chaussée. Merci beaucoup! Vous avez été également des hôtes très agréables. A une prochaine fois j'espère. Nous tiendrons compte de votre remarque sur les portemanteaux! Walking and mountain biking trails lead from the building. There are beginners Enduro courses, tree climbing, and a mountain bike centre 4 km away.